An incomplete lead-alloy pilgrim's ampulla, of medieval date AD 1350 - 1550. The body of the hollow ampulla is semi - circular, with short, straight, sides which would have extended up to a neck, now missing. Here the damaged edge shows the construction of the piece by revealing the hollow interior. The obverse is slightly rounded, with a reversed S centrally placed. Other decorative elements are indiscernible. 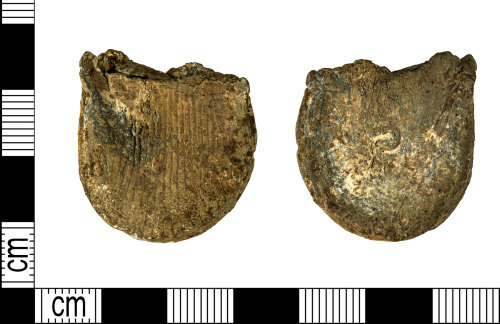 The reverse is flatter and slightly hollow, with its surface covered in a series of fine lines radiating out from the broken edge, to the rounded edge, in imitation of a scallop shell. The scallop shell was the badge of St. James of Compostela and the emblem of pilgramage itself. Length,28.8mm, width 27.4mm, thickness 5.0mm and weight 17.51g. The thickness of the lead walls 0.8mm. Ampullae were important pilgrim souvenirs known to have been in use from the late 12th century and were designed to contain a dose of thaumaturgic water, which would have been given to pilgrims at holy shrines and wells. The water would be taken as a cure to illness or disability or worn as a talisman. The popularity of ampulla dwindled in the early 14th century, giving way to pilgrim badges, however it is believed that they continued in use to the end of the 15th century. Spencer,B. 1990, page 88, Fig 179. Spencer, B., 1990 Salisbury Museum Medieval Catalogue: Part 2, Pilgrim souvenirs and secular badges Salisbury: Salisbury and South Wiltshire Museum Page 88. , Fig, 179.